The walk-in cooler at the Food Bank of Santa Barbara County’s Santa Maria facility is filling up slower and moving produce out faster than it has in the past. 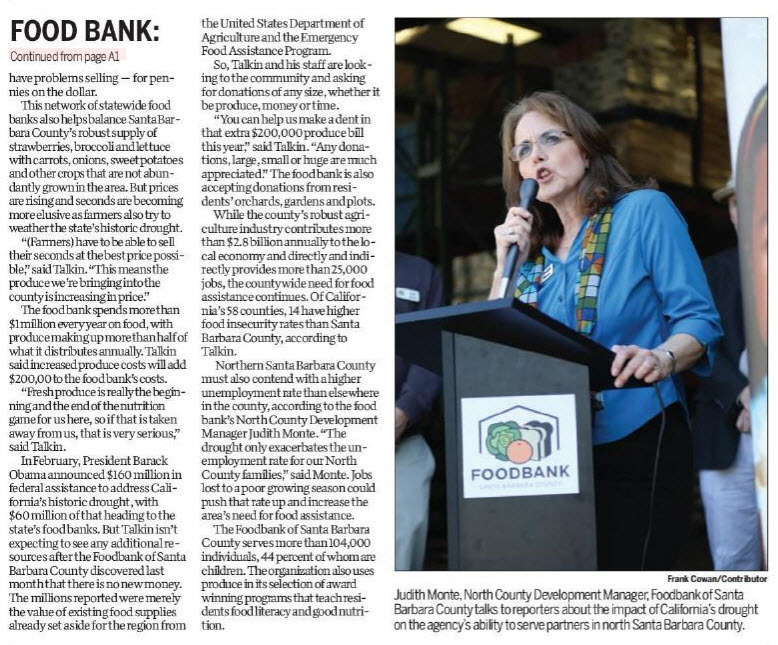 This is partially attributable to environmental factors like the drought, Jamie Nichols, food bank director of operations, told the Sun after an April 16 press conference. Farmers’ yields are lower because of the lack of rain, as well as state water delivery issues. Nichols said lower yields up the pressure farmers feel to make their harvests stretch. Those things that characterize a fruit or vegetable as not good enough for grocery store shelves—blemishes and shape—don’t apply this year. All of those factors add up to the food bank simply not getting produce delivered like it used to. Nichols said the food bank used to get regularly delivered truckloads of stone fruit, tomatoes, and melons—often for free. Food Bank Chief Executive Officer Erik Talkin said during the press briefing that produce is in shorter supply and more expensive than it has been in years past. Talkin added that fresh produce is a huge part of the Food Bank’s mission; it’s a necessary part of the food literacy programs offered by the organization, as well as for the health of the people they serve. “We can’t just switch to frozen or canned vegetables,” Talkin said. He explained that 55 percent of the Food Bank’s product is fresh produce that’s either bought or donated. Usually, it costs the organization about $1 million a year to bring it in, this year it will cost an additional $200,000. During the press conference, Nichols said that although the U.S. Department of Agriculture is allocating some emergency funds for programs like the Santa Barbara’s Food Bank, that will only cover 15 percent of the organizations that need it. This entry was posted in News and tagged Santa Maria Sun on April 23, 2014 by Judith Smith-Meyer. The Foodbank of Santa Barbara County will get some welcome donations and assistance Saturday as part of this year’s Central Coast Helping Hands event, which will send volunteers to a number of projects in Santa Barbara and San Luis Obispo counties. Volunteers will collect and sort food donations as well as paint the Santa BarbaraCounty food bank’s 100 collection barrels and repackage bulk foods, from 8:30 a.m. to noon at St. JosephHigh School in Orcutt. Food can also be dropped off and sorted at ArroyoGrandeHigh School. As California’s drought continues to drive up produce prices, the food bank’s expenses are expected to increase by $200,000, making it tougher to provide for its clients and its more than 300 nonprofit partners. The Foodbank of Santa Barbara County served more than 100,000 people last year, providing food assistance to one in four county residents. Helping Hands has also partnered with the San Luis ObispoCounty food bank and the 5 Cities Homeless Coalition. “Even if people can’t stay and help us sort or do other projects, if they can just drop off food, that’s great too,” said Darren Hulstine, president of the Santa Maria California Stake of The Church of Jesus Christ of Latter-day Saints. Hulstine’s group has hosted the Central Coast Helping Hands event for about eight years. Organizers have scheduled a number of other projects to keep community volunteers busy both nearby and in San Luis ObispoCounty. Those interested can help with repairs at St. Joseph’s High School, the DunesCenter and the Historic Jail in Guadalupe. Organizers will also send volunteers over to the AbelMaldonadoCommunityYouthCenter to take part in Serve Santa Maria Day, an annual day of local community service. In San Luis ObispoCounty, participants can help with landscaping and maintenance projects at the Arroyo Grande Women’s Shelter and the ArroyoGrandeCommunityGardens. For more information, visit centralcoasthelpinghands.org or call 714-2901. This entry was posted in News and tagged Santa Maria Times on April 22, 2014 by Judith Smith-Meyer. *Your donation will be used as a challenge grant to the community. For more information, contact Misha Karbelnig, (805) 967-5741 x 119 . It’s a great recognition opportunity. This entry was posted in Uncategorized and tagged Share Your Lunch, sponsors, sponsorship opportunities on April 22, 2014 by Judith Smith-Meyer. This entry was posted in News and tagged Lompoc Record on April 17, 2014 by Judith Smith-Meyer. This entry was posted in News and tagged Santa Barbara News-Press on April 17, 2014 by Judith Smith-Meyer. 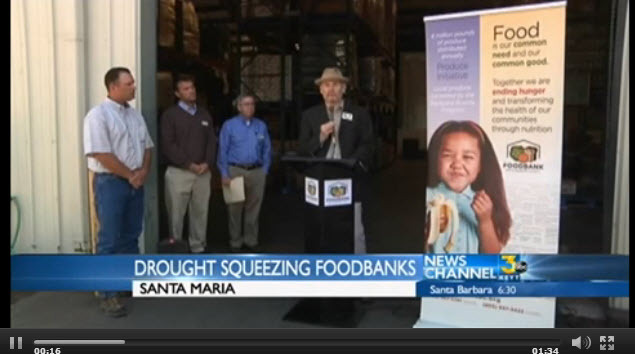 A promotion late last year is benefiting the Foodbank of Santa Barbara County. A check for more than $2,000 will be presented to the organization Thursday night from Santa Barbara Gift Baskets. The company held a gift basket promotion last December with a portion of the proceeds going to the Food Bank. Organizers say the Food Bank can purchase $17 worth of food for every $1 donated. This entry was posted in News and tagged NBC News on April 17, 2014 by Judith Smith-Meyer. 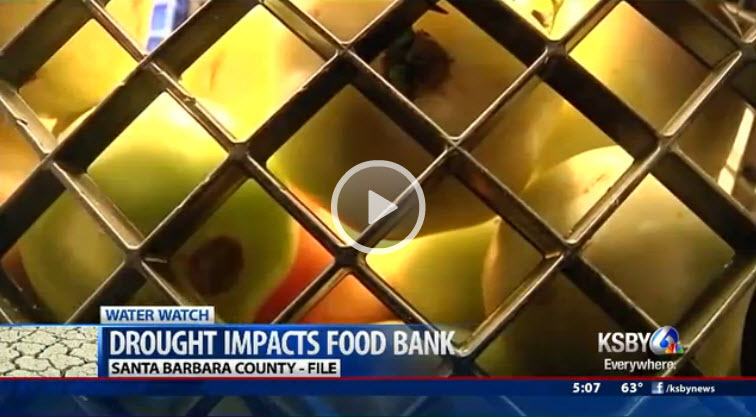 The Santa Barbara County Food Bank says the dry conditions have a negative impact on its services to help the hungry. The Food Bank works with the state agency Farm to Family to purchase fresh produce for families who can’t afford food. Officials say due to the drought, the cost to buy produce through the program has gone up. Local farmers are also having a hard time being able to donate money or food. The Food Bank says you can help by donating more than just canned and dried goods. You can drop off fresh produce you purchase or even grow it in your garden. This entry was posted in News and tagged KSBY on April 17, 2014 by Judith Smith-Meyer. POSTED ON 04.16.2014 11:38 A.M.
Santa Barbara Gift Baskets will present a check for more than $2,000 to the Foodbank of Santa Barbara County on Thursday at the Foodbank’s Multi Chamber Mega Mixer. The donation stems from a promotion Santa Barbara Gift Baskets launched in December, featuring a gift basket filled with local gourmet foods. Twenty five dollars from the sale of each $125 gift basket was collected for donation to the Foodbank to use toward its mission to eliminate hunger by providing food, education and other resources to a network of hunger-relief charities in Santa Barbara County. Each Foodbank Holiday Gift Basket included a card that informed the recipient that their gift consisted of not only the delicious treats nestled inside, but also a donation of $25 to the Foodbank. According to the Foodbank, for every $1 it receives as a donation, it is able to purchase $17 worth of food. That translates to $425 worth of food per gift basket purchased, and more than $35,000 for the entire donation. The Foodbank was not the only organization benefiting from the sale of the basket. Fourteen local businesses were represented among the gourmet contents. Every dollar spent on the Foodbank Holiday Gift Basket stayed right here in Santa Barbara County, supporting the local economy as well as its most needy residents. Several local businesses chose to send the Foodbank Holiday Gift Basket as their client appreciation gift this year, including Heritage Oaks Bank, Best Western of Carpinteria, and Penfield & Smith Engineers. The Foodbank Multi Chamber Mega Mixer will be held from 5 to 7 p.m. Thursday at the Foodbank warehouse at 4554 Hollister Ave. Members and guests of the following Chambers of Commerce will participate in this free networking event: Santa Barbara Region, Goleta Valley, Carpinteria, Buellton, Solvang, Lompoc, Santa Maria, San Luis Obispo and the Santa Barbara Hispanic Chamber. Some of the local food purveyors included Santa Barbara Pistachios, Santa Barbara Biscotti, La Tolteca Tortilla Factory, Santa Barbara Olive Co., Pacific Pickle Works, Shalhoob Meat Co., Jessica Foster Chocolates, Goodland Chai, Ocean Ranch Organics, Burst Marshmallows, San Marcos Farms, Caribbean Coffee, the Santa Barbara Bar and Santa Barbara Gourmet Popcorn. The basket also included a copy of Edible Santa Barbara Magazine. — Anne Pazier represents Santa Barbara Gift Baskets. This entry was posted in News and tagged Noozhawk on April 16, 2014 by Judith Smith-Meyer. Foodbanks are paying more for higher demand staple crops. The Foodbank of Santa Barbara County helps those who need help putting food on the table. The immediate impact of the ongoing drought in California is starting to be felt throughout the state including front line social safety network agencies like Foodbanks. 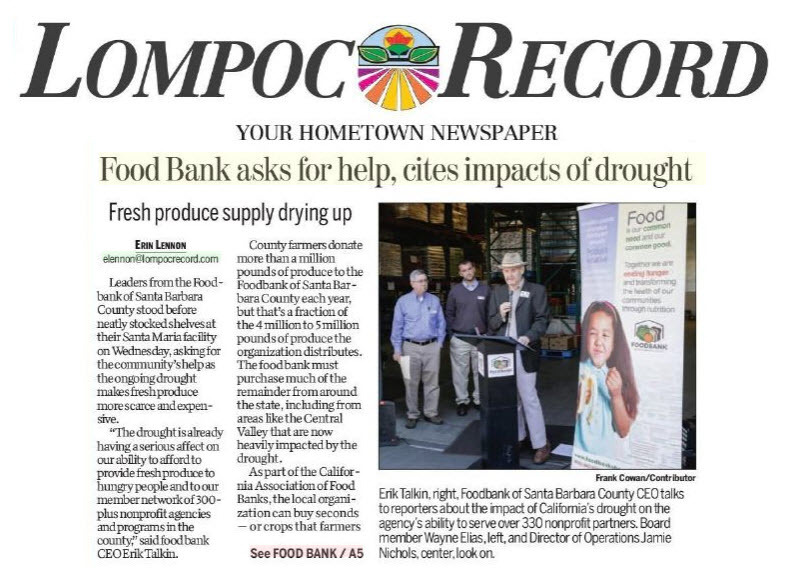 “The drought is already having a serious affect on our ability to afford and provide fresh produce to hungry people and to our member network of 300-plus programs and agencies in the county”, Talkin says. Foodbanks are now having to compete with others in the food industry for staple crops like onions, potatoes, carrots and corn that are down in production due to the drought. The Foodbank of Santa Barbara County welcomes donations of fresh produce. But it says cash donations are what’s really needed to help it weather the tough economic climate of the ongoing drought. This entry was posted in News and tagged KEYT on April 16, 2014 by Judith Smith-Meyer. 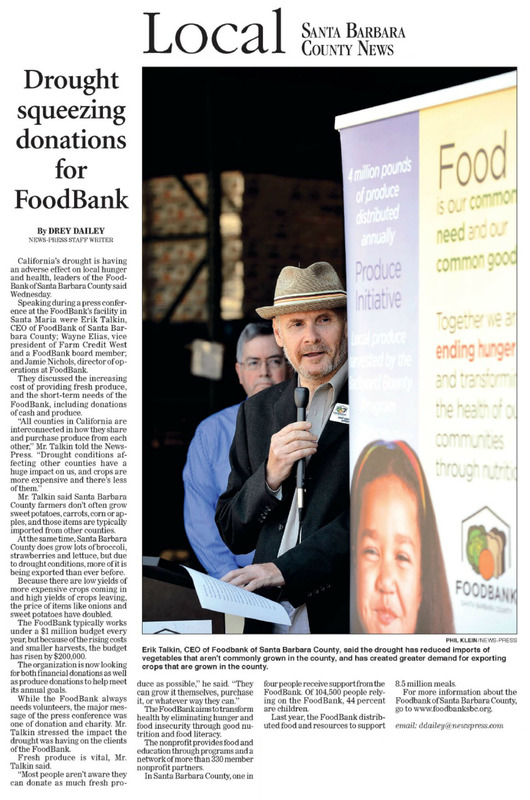 Foodbank SB presents its first Multi-Chamber Mega-Mixer! Join us for great door prizes, delicious food and drinks. A phenomenal networking event! Don’t miss it. It’s a party! !